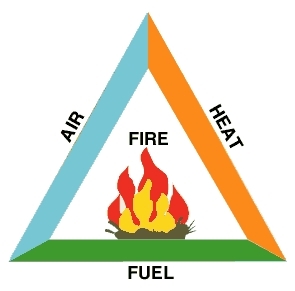 The fire triangle illustrates the rule that the combustion reactions require three elements to proceed. 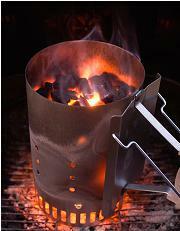 Reduce or remove any element and the fire will lose power, smolder, or go out altogether. This simple rule is critical when cooking with charcoal and especially wood fuel, as we’ll shortly see in How Wood Burns. Assuming we maintain good geometry/heat, a fire’s thermal output will be constrained by a shortage of air or a shortage of fuel – never both at the same time. We’ll discuss these control methods in Common Pits.